Now, God has blessed. I have another family: I have a wife, a son, a daughter, and a grandson about seven, eight years old. And the Lord has lead me, and he will lead you. And I hope, some way, somehow, if you don’t sing “Precious Lord, take my hand,” you will learn to sing it, and sing it with a feeling and a fervor. Dorsey’s wife, Nettie Harper, died on 26 August 1932. Dorsey had started his career as a blues musician, but turned his attention to gospel music in the 1920s, thus the reference to returning to the blues. The song was not copyrighted until 1938, when it was published as sheet music by Thomas Dorsey’s own company (Fig. 1), with three stanzas. The original setting was for solo voice and piano/organ. Fig. 1. “Take my hand, precious Lord,” Thomas A. Dorsey (Chicago, ©1938), excerpt. An additional verse, “Precious Lord, I love your name,” was recorded by Thomas Dorsey in 1982 or 1983 at an annual meeting of the National Convention of Gospel Choirs and Choruses, a convention Dorsey started in 1933. This recording was included on the album Say Amen, Somebody (DRG Records, 1983). These additional words are not well known but can be found in hymnals such as the African American Heritage Hymnal (Chicago: GIA, 2001). Tune. The music to this hymn is an adaptation of a much older tune known as MAITLAND. The tune is often erroneously attributed to George N. Allen and/or his Oberlin Social and Sabbath School Hymn Book (1844), but Allen’s collection did not contain music and Allen is not known to be a composer of hymn tunes. Allen’s involvement is in the adaptation of the text “Must Jesus bear the cross alone,” to which MAITLAND was frequently set before becoming associated with Dorsey’s text. The tune first appeared twice in 1855. One of these was Henry Ward Beecher’s influential Plymouth Collection of Hymns and Tunes (NY: A.S. Barnes & Co., 1855 | Fig. 2). 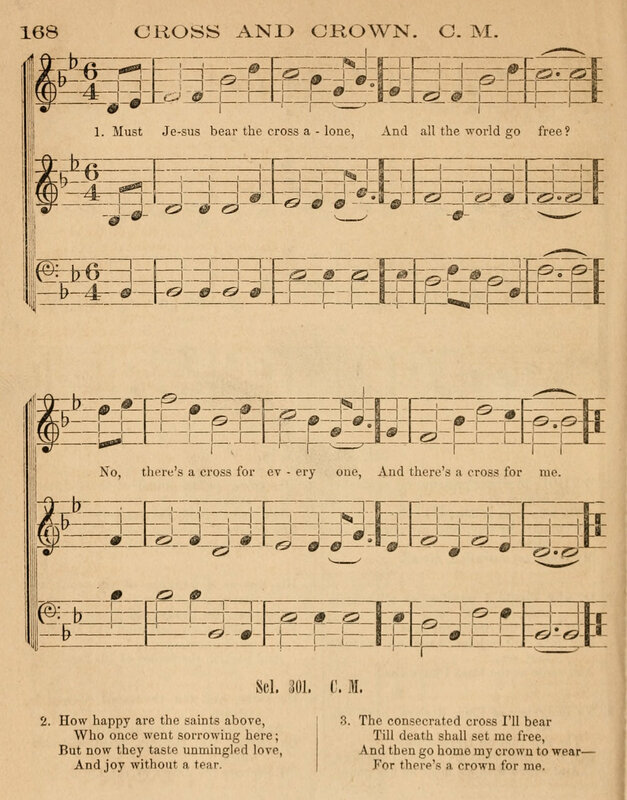 In this printing, the tune was called CROSS AND CROWN, credited as “Western Melody,” and set to “Must Jesus bear the cross alone,” text credited to Allen. Fig. 2. Plymouth Collection of Hymns and Tunes (NY: A.S. Barnes & Co., 1855). That same year, the tune also appeared in Church Music (Rochester: E. Darrow & Brother, 1855 | Fig. 3), edited by Leonard W. Bacon for St. Peter’s Church, Rochester, NY. Here, the tune was called CROSS AND CROWN, paired with “Must Jesus bear the cross alone”; no other identifying information is on the page. Fig. 3. Church Music (Rochester: E. Darrow & Brother, 1855). Fig. 4. The Sabbath Hymn and Tune Book (NY: Mason Brothers, 1859). Thomas A. Dorsey, “The birth of ‘Precious Lord,'” Guideposts, October 1987, pp. 81-82. Carlton Young, “Precious Lord, take my hand,” Companion to the United Methodist Hymnal (Nashville: Abingdon Press, 1993), p. 561. Bert Polman, “Precious Lord, take my hand,” Psalter Hymnal Handbook (Grand Rapids: CRC, 1998), p. 662-663. Paul Westermeyer, “Precious Lord, take my hand,” Companion to Evangelical Lutheran Worship (Minneapolis: Augsburg Fortress, 2010), pp. 637-639. Carl P. Daw Jr. “Precious Lord, take my hand,” Glory to God: A Companion (Louisville: Westminster John Knox, 2016), pp. 795-796.